Great Oaks President and CEO Harry Snyder is enthusiastic about a construction and renovation project at Laurel Oaks Career Campus. 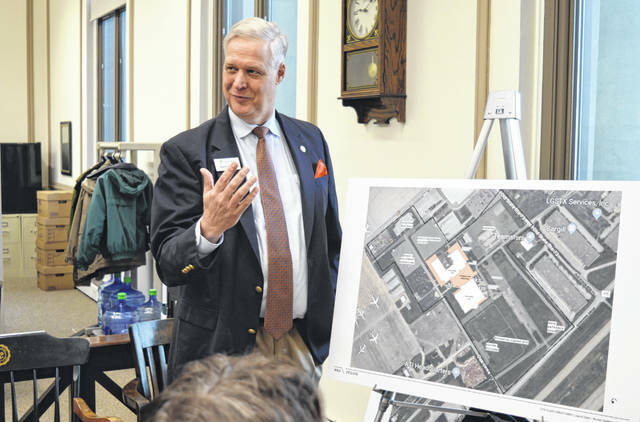 WILMINGTON — While giving an overview of an upcoming construction and renovation project at Laurel Oaks Career Campus, Great Oaks President and CEO Harry Snyder reported the student body at the Wilmington site is growing the fastest among Oaks’ four campuses. Five years ago, about 450 high school seniors and juniors attended Laurel Oaks. That has risen to more than 600 students, Snyder told Clinton County commissioners in his presentation. So the expansion planned for the Wilmington campus is a timely project. There will be additional space, enlarged classrooms or career labs, two new high-bay structures suited for certain career programs, and an expanded cafeteria. The new facilities will have a capacity of up to 700 students, said Snyder. Miami Trace High School and Washington High School are affiliated Laurel Oaks. In addition to expansion, another key consideration for the project is to improve the security of students and staff, he said. A couple other new features will include an identifiable main entrance and newly designed access so nobody has to cross a street with motor vehicle traffic. The project is expected to take three years to complete. Rather than a ground-breaking, this June there will be what’s being called a lift-off, a nod to Laurel’s aviation maintenance technician program. Though they are still working out firmer numbers, the project is estimated to come with a $25 to $30 million price tag, said the Great Oaks president. The expansion project at the Wilmington campus was made possible when Great Oaks Career Campuses’ 2.7-mills renewal levy was approved by voters in southwest Ohio last November. The levy passed as a continual levy, and thus can finance building projects for longer than the term of a levy that had to be renewed after a certain period. High-bay structures have higher ceilings and so one of the new Laurel Oaks’ high-bay spaces will be utilized by the heavy equipment program. Snyder said the use of the second high-bay space has yet to be determined, with Oaks’ officials exploring various program options. An extra classroom/career lab may be used for a cyber security program, said Snyder. If so, it would complement Laurel’s current programs in computer networking, digital arts and design, and web applications. Snyder said Great Oaks respects the history of the Laurel location — an area used for testing gliders for World War II; later a base for the U.S. Air Force (Clinton County Air Force Base); and then a large air freight hub with thousands of workers. Accordingly, plans call for building a designated space that probably will be about 2½ stories high. The tall space will be used to display aviation-related replicas built by students over time. Snyder anticipates replica gliders, replica bombers to represent the Air Force period, and replica Airborne Express jets. Replica drones (or, given some of their sizes, the real thing?) could also be included. Already Laurel students eat in an overflow area because the cafeteria is not large enough. To expand the cafeteria, the stage and auditorium will be taken out. The Laurel Oaks site is approximately 80 acres, while Great Oaks owns 120 acres total in this area, said Snyder. All four Clinton County school districts are affiliated with Laurel Oaks — Blanchester High School, Clinton-Massie High School, East Clinton High School and Wilmington High School. Also affiliated with Laurel are Fairfield Local High School, McClain High School, Hillsboro High School and Lynchburg-Clay High School. https://www.recordherald.com/wp-content/uploads/sites/27/2019/03/web1_snyder_oaks.jpgGreat Oaks President and CEO Harry Snyder is enthusiastic about a construction and renovation project at Laurel Oaks Career Campus.